The play’s the thing. Hamlet said this as he concluded that the way in which his uncle would watch a play would show whether or not he was guilty of killing Hamlet’s father. In Shakespeare’s time, the word thing meant a subject for discussion in a public assembly. Its original meaning in English was a judicial or legislative assembly (Iceland’s parliament is still known as the Althing). After Shakespeare’s time, the word thing was generalized into any object. The single object has been such a strong center of gravity in Western thought and perceptions that it’s often taken for granted as basic reality, and other ideas easily get pulled into it like orbiting satellites. But in Laos and many other Southeast Asian cultures, the thing’s the play. Come and explore a different way of thinking about the world. 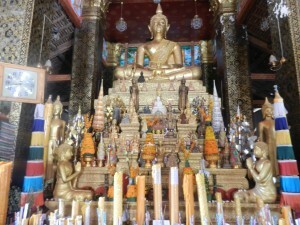 The above photo is of the altar in Wat That Luang, in Luang Prabang. 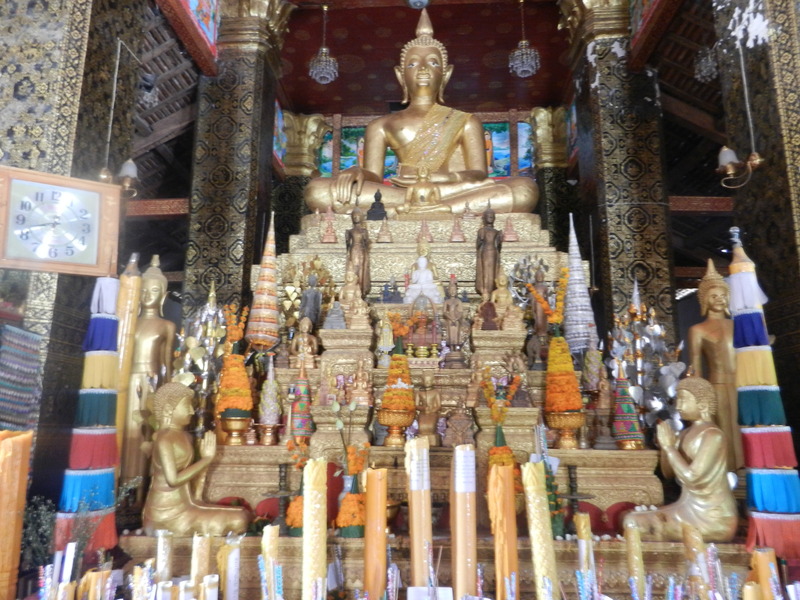 Most of the public assembly halls in the dozens of Wats in Laos and the hundreds of wats in Thailand that I explored had an altar with a main Buddha statue surrounded by a multitude of other objects. But they’re not just ordinary objects. 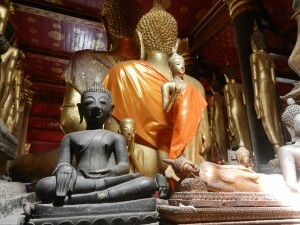 These statues, candles and banners flicker and glow. They’re not to be examined in detail–they radiate. 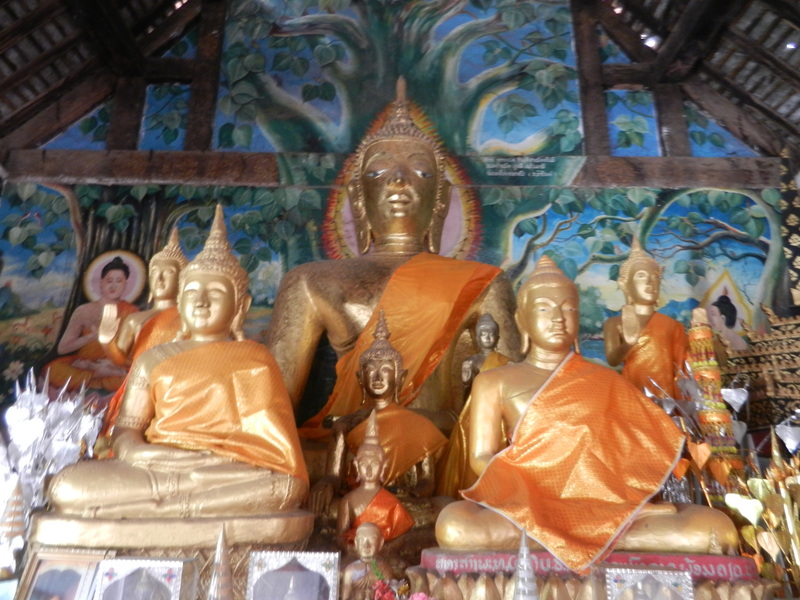 The statues in Luang Prabang’s Wat Monorom (pictured above) also seem to mesh into a field of glowing colors and graceful forms that bestow benevolent energies on people who come to worship. 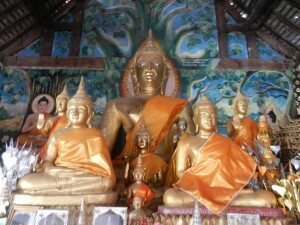 The Sukhothai style statue in Luang Prabang’s Wat Monorom is also surrounded by many other statues. They’re in different styles. 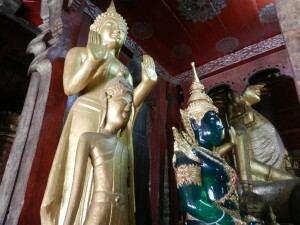 The one in the middle is a Phra Singh copy–this style came from the northern Thai kingdom of Lan Na, which was centered in Chiang Mai. When you slowly walk around the altar, the statues hide behind each other and reappear, like these in Luang Prabang’s Wat Mai. 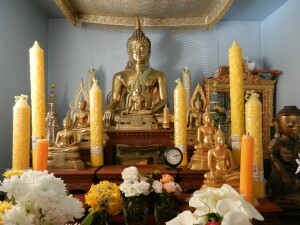 I’m behind Wat Mai’s altar in the above shot. These statues’ forms aren’t static, like an ancient Greek temple. 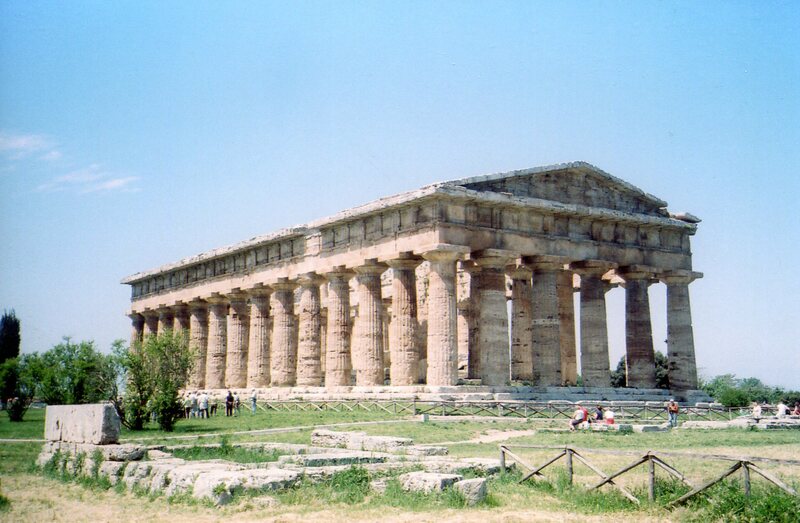 The ancient Greek temple is a perfect distinct entity–the perfect thing. 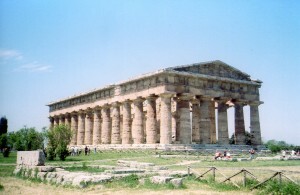 It’s complete and independent, and its forms are linear and proportioned, like the temple of Neptune in Paestum (above). 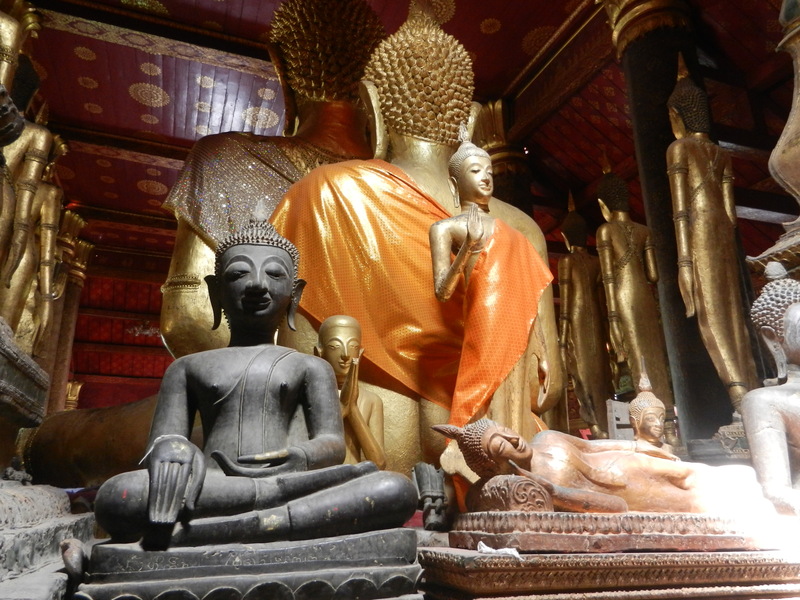 But the statues in Laotian temples have kinetic appeal–as you amble around them, their curvy forms and radiant colors glimmer together, and they make you feel like your part of a stream of graceful energies. This aesthetic is widespread in Southeast Asia–you can savor it in any country, including Vietnam. It mirrors its natural environment. Both express abundance that’s irreducible to any single form. The world hangs together through harmony between all forms. 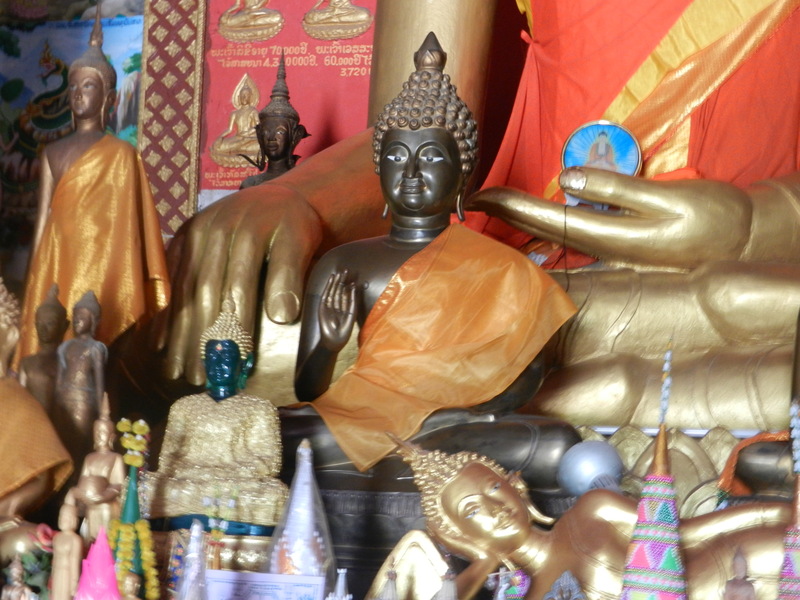 If you’ve read a lot of my articles on Thailand, you’ve already seen this perspective. Why am I sharing it again? 1. A large and diverse region of the world has embraced this way of seeing, and its people have expressed it in infinite varieties. 2. I find it incredibly beautiful–this is one of the reasons why Southeast Asia is one of my favorite regions. Every variety expresses joy and abundance, and its blend of many forms is a great model for world harmony. Lots of other people feel the same way. In the above photo, I’m celebrating Laotian New Year 2012 in a temple in Silicon valley, which was formerly a house that the Laotian community had bought and converted. 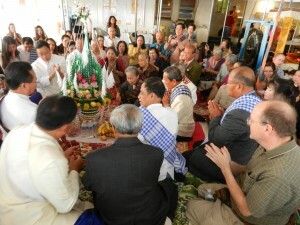 The crowd and the offerings of food blended into a general feeling of civility and prosperity. The altar also has the vibrant mixture of forms that altars in Laos do. I think these blends of objects that seem to flow together like rippling energies are some of humanity’s most beautiful creations. They’re not studied in most schools–I feel sorry for their students for missing them. But they’re in every Southeast Asian country, and they’re spreading all over the world. Anyone who discovers them is blessed. I very much enjoyed your perspective and ability to put it into words. Thank you!